When I was paying my respects to family members recently, I came across this memorial in Evergreen Cemetery. The name was familiar because when I was growing up, I recall my grandmother and great-grandmother speaking fondly of Lark Martin as Fitzgerald’s most famous hero of World War II. They even had a copy of The Saturday Evening Post which featured a story about him. 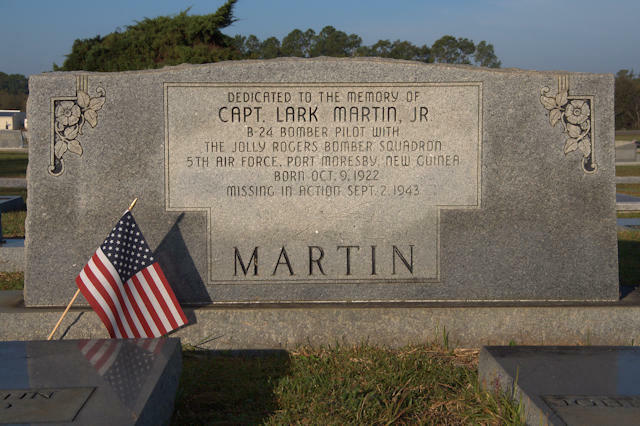 Captain Lark E. Martin, Jr., was born on 9 October 1922 and when he was still a teenager, he was already a B-24 pilot serving in the Pacific Theater with the Jolly Rogers Bomber Squadron, 5th Air Force, based in Port Moresby, New Guinea. A little over a month before his 20th birthday, on 2 September 1943, while piloting the “Battlin’ Betts”, Martin was killed in action. His co-pilot, engineer, radio tech, and five passengers were also lost.